A good few years ago I undertook a Performing Arts course and on the whole embraced every aspect of the course except the dreaded movement class. I disliked the movement classes and if like at school there had of been a report at the end of the year I would have definitely been in the ‘must try harder’ category. I could not get the point of the classes, imagine the stereotype scenario of a movement class whilst reciting phases like ‘feel the space’ and ‘let your movements be organic’. You’re possibly getting the picture. However, not one to easily dismiss things, after completing my course I decided to explore the areas of physical theatre and contemporary dance and one of the first performances I saw was by Phoenix Dance Theatre, performing a piece called Planted Seeds by choreographer Darshan Singh Bhulller. I cannot recall fully what happened in the piece, a work reflecting on the abuse of human rights in the former Yugoslavia, but over ten years since I can still remember how I felt having seen Planted Seeds, and how emotive it was. It was beautifully executed yet brutal, sometimes too shocking to watch but equally too compelling not to. I came out of the theatre feeling emotionally drained but wanting more; I was hooked and so began my love of contemporary dance and physical theatre. So it was with some trepidation that I agreed to review Phoenix Dance Theatre on this visit to the Liverpool Playhouse, because the company was my introduction to contemporary dance and they unwittingly set the benchmark on which I have compared other performances against. My expectations for Crossing Points were set high – so did they deliver? Crossing Points comprised of four separate pieces: two new works, Catch and SoundClash, and two established works Signal and Maybe Yes Maybe, Maybe No Maybe. The company’s artistic director Sharon Watson described a dance programme being like a meal in that you may like different bits to varying degrees; so you may love the starter, think the main is okay and adore the desert. Well I can say that I thoroughly enjoyed the meal Phoenix Dance Theatre served up on Friday evening and that I was left equally satisfied and hungry for more. Previously when I saw Phoenix perform on a large stage, I felt the pieces and dancers were lost in the space. At the Playhouse the works and dancers filled the space and as an audience member it was good to be able to be so close to the movement, particularly when there were more intimate elements in the performances. However, the size and nature of the stage also had its drawbacks which were evident in the company’s first piece Signal. 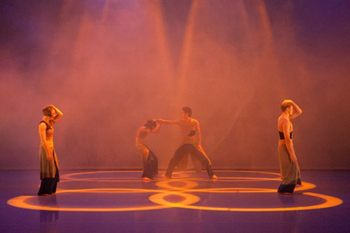 Signal was first performed by Phoenix in 2004 and is by renowned choreographer Henri Oguike. The piece comprising of five dancers was danced to the stirring rhythms of Japanese Taiko drums. I must admit I was slightly disappointed that the drums were not present on stage as I find them an interesting instrument to watch being played, but I suppose that is one of many reasons not to have them on stage as after all it is the dancing the audience came to see! The piece started with an engaging solo section by Ryu Suzuki who was then joined by dancer Chihiro Kawaski. In this section the atmosphere was relatively calm with the pair dancing in unison. The feel of the piece started to increase in tension when a trio of dancers (Glenn Graham, Phil Sanger and Genevieve Watson) came on for a section in which the dancers seemed to be in a conflict of being drawn to and repelled against each other. For me the interesting aspect of the piece was the contrast of moves; from the dancers moving like automatons with specific limbs leading the movement to the more fluid and beautiful moves. There was a captivating moment where the aforementioned trio linked to create a wave like movement, where the speed and uninterrupted flow of the move was astounding. The timing of the piece was good and the use of the music to accentuate certain moves was used to great effect. When the full ensemble for the piece was on the stage the atmosphere became more frenzied and energetic. It was at this point where you could see the commitment of the dancers, as they ran at speed in a circle and on and off stage. Given the relatively small size of the stage and that upstage there were three lit fire bowls it was impressive to see that the dancers were not fazed (or certainly gave this impression) and threw themselves completely into what they were doing. I later found out in the Q&A session that the stage is also raked therefore the dancers had to work up hill too, which makes their commitment and stamina all the more remarkable. 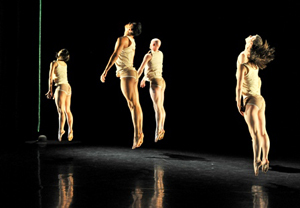 One drawback with the size of the stage was that as the dancers ran off the stage you could see them slowing down as they approached the wings; which as a viewer made the piece briefly lose some of its momentum. However, this small hitch aside Signal was a rousing performance and one which left me excited to see the rest of Crossing Points. During the interval I overheard (well, ear-wigged) a conversation between a man and his daughter regarding Signal; the man asking (almost verging on pestering) his daughter what she thought of the piece; what did she think the piece was trying to say and was there a message in the piece etc. The daughter did struggle slightly with the questioning and hesitantly gave an answer. I could empathise with the daughter as when I first started watching dance I found that often I would not enjoy a piece or get frustrated as I was always wondering what was the choreographer was trying to tell me. It was only when I stopped worrying about what the choreographer was trying to get across and just appreciate the dance for what it was that I began to love the art form. I concurred with Phoenix dancer Azzura Ardovini when she remarked that the great thing about dance is that there is no right or wrong and that it is open to interpretation. Similar to a painting, I can appreciate it and decided whether or not I like it without knowing the artist’s intention. However, and at the risk of contradicting myself, as well as just enjoying a dance on face value, knowing some background to the piece can add another dimension to it, as I found with my favourite piece of the night Catch. Catch by choreographer Ana Luján Sánchez takes its concept from René Magritte’s iconic painting ‘The Son of Man’ (the suited man wearing a bowler hat with an apple obscuring his face). The piece began with sinister sounding violin music (music by Borut Krzisnik) as the suited dancers with white shirts and red ties walked on stage one by one. Once all the dancers were on stage (six in total) the stage felt very full as the ‘faceless’ drones moved like clockwork going about their own business. The piece made me feel very uneasy as there were moments were a group appeared to be intimidating one dancer. The piece reminded me of Kafka’s ‘The Trial’ with the group acting like inquisitors and bullies over the one being suppressed. Knowing that the piece had drawn upon Magritte’s ‘Son of Man’ helped me to particularly enjoy the section in the piece where the dancers appeared to unintentionally hide each other, so at times the audience caught a brief glimpse of a dancer’s smirk or shocked expression only for it to be obscured by another dancer suddenly moving in front of them. I found myself shifting on my seat wanting to see what was behind each dancer; to paraphrase Magritte (in reference to his painting) everything I saw hid another thing and the frustration was that I always wanted to see what was hidden by the thing I could see. As the piece progressed the dancers started taking parts of their clothing off with a climax coming when they all removed their red ties and tied them (the ties) around different parts of their body. Dancer Azzura Ardovini tied her tie around her arm triggering what looked like a drug induced stare in her, followed by an anarchical frenzy and rebellion by the whole group. The mood then suddenly altered when a rope was dropped from the ceiling and left suspend and the lighting changed from intense red to a calming blue. The dancers were now in their underwear and worked as a team as each member tried to approach the rope only to be rebounded from it on approach. This section worked well as I like the dancers wanted one of them to make it to the top of the rope to see what was above, what was being hidden? The strength of Catch was the way it drew me in as a viewer and being able to empathise with the dancers’ quest to see the ‘invisible’ made me want to watch all the more to see if we (the audience and the dancers) would be successful in our pursuit. From the narrative feel of Catch, the evening progressed to the company’s more playful piece (and one of Phoenix’s favorites) Maybe Yes Maybe, Maybe No Maybe by Aletta Collins. The stage was stark with white lighting and a single live microphone suspended from the ceiling into the middle of the stage. The work set to a score by composers Street Furniture transformed the dancers’ voices into the beats and accents of a pulsing soundtrack. As discussed by dancer Phil Sanger this piece is viewed as the ‘entertaining’ one and because the dancers are familiar with it the one they play with, although judging from comments and looks given by artistic director Sharon Watson and rehearsal director Tracy Tinker, perhaps sometimes the adlibbing was taken too far. The most enjoyable aspect of the work for me was that you felt you were seeing the dancers’ personalities coming out. The dancers’ familiarity with the piece also meant they could interact with the audience somewhat, for example at the start of the piece dancer Phil Sanger comes onto a silent stage and shouts into the mic’ which resulted in gasps from the audience. This work went down well with the audience and it was good programming to present a section in which the audience had a chance to be vocal and gain a little light relief before the intensity of the final piece SoundClash. SoundClash is a new work by Kompany Malakhi’s Kwesi Johnson which is inspired by the world of cymatics (the study of patterns created by sound waves when made visible). Before any dancers took to the stage the audience were brought immediately into the piece by the pounding music (by Luke Harney) which I could feel reverberating in my feet. In terms of visuals in addition to watching the dancers there was also the added element of seeing an upstage projection of the water patterns, which were created by the vibrations of the music. My fascination with this work was how even though sometimes the dancers’ movements and the water patterns clashed with the sound, as the dancers often moved at a slower and calmer tempo as did the movement of the water patterns against the pulsating soundtrack, it bizarrely worked. The potency of the work was that it had the power to make me feel energised and serene, sometimes at the same time. Crossing Points is a great programme of dance with a good mix of narrative, entertainment and playfulness. I think an audience would be hard pushed not to find something they liked in the programme or have some reaction to. I thoroughly enjoyed the whole collection from the simplest level of admiring the dancers’ athleticism and watching the power and beauty of their movements to being literally and metaphorically on the edge of my seat absorbed in what I was viewing. There were aspects that I felt could have been tighter particularly in some of the sections were the dancers were in performing in unison. However, considering that two of the works are new (the evening was the first performance of the Crossing Points tour), and as dancer Glenn Graham admitted, he was still counting some of the moves in his head, the group did a marvelous job and the mention of the tightness does feel as though I am nitpicking. Crossing Points has kept Phoenix Dance Theatre as one of my ‘must see’ dance groups and I would like to thank the company for reminding me of how they dispelled my earlier preconceived ideas of contemporary dance.